If You’re Short On Time, Skip The Pizza Delivery And Whip Up This Saucy Chicken Dish In Minutes! When it’s been a long day, sometimes we just want to order a pizza for dinner. While that’s a perfectly fine option, it’s nice to have a few go-to recipes in our back-pocket that taste great and only take a few minutes to make, and this pepperoni chicken is definitely one of them! 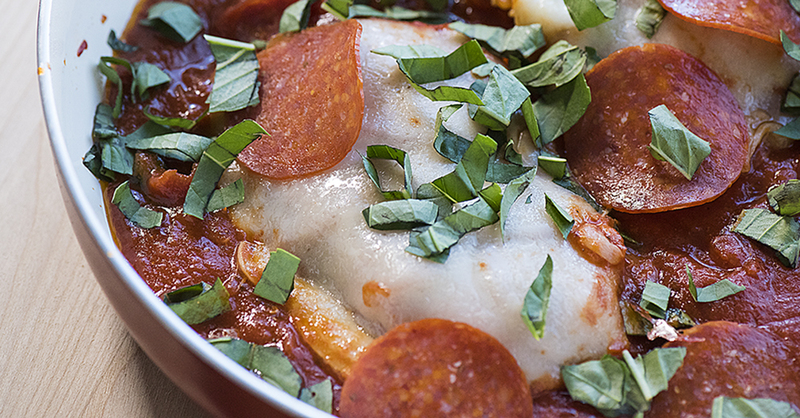 Chicken cutlets cook up in minutes, then we top the mild meat with salty and robust pepperoni, melty mozzarella, and jarred marinara, and that’s it! Done! In less that 20 minutes we can get a no-fuss dinner on the table, making this a staple in our weeknight dinner rotation. Slice both chicken breasts through the middle to create 4 thin cutlets, and liberally season with salt and pepper. In a large skillet, heat olive oil over medium-high heat. Once heated, add cutlets, and brown for 2-3 minutes, then flip and cook an additional 2-3 minutes, or until cutlets are just cooked through. Transfer chicken to a plate. Pour marinara sauce into skillet, and stir to pick up any brown bits from the chicken. Once marinara has heated through, add chicken back to pan. Top each piece of chicken with a layer of pepperoni and a slice of mozzarella. Cover the skillet, and cook for 3-4 minutes, or until cheese is melted. Spoon marinara over cutlets and top with parsley or basil.